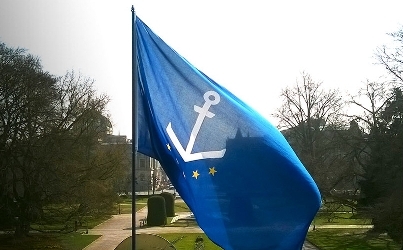 The Central Commission for Navigation on the Rhine (CCNR) in Strasbourg has a new flag.This flag is based on the new visual identity created for the bicentenary of the CCNR. "This is the result of joint consideration of the matter by the Heads of the Delegations of the CCNR’s five Member States (Belgium, France, Germany, the Netherlands and Switzerland) under the leadership of its Secretariat. Its new visual identity reflects the tasks of this unique and discreet organisation which holds the record as the world’s oldest international organisation still in existence." "The new visual identity reflects the current dynamic of the organisation. Its central pictogram, an anchor, is a reference to its prime task of ensuring “the freedom of navigation on the Rhine” which its five Member States, symbolised by the stars following the shape of the anchor, undertook to uphold by signing the final Act of the Congress of Vienna in 1815." "This new identity is the work of the Strasbourg communication agency Press Agrum." This visual identity exists also as a flag, that replaces the old flag (light blue with four dark blue stripes and six yellow stars). It looks a bit more like the European flag. This flag flies for several months now on the front of the Rhine Palace, Republic Square, in Strasbourg, where the CCNR is. The flag of the Central Commission of the Rhine, as shown in Album des Pavillons [pay00], is light blue with in upper half six five-pointed yellow stars arranged in an hexagonal pattern, and in lower half four dark blue stripes and a yellow anchor over those stripes. Why did the old flag have six stars? United States or United Kingdom perhaps? The United States was temporarily a member immediately after World War II, while Germany was under Allied occupation. Then the current revised convention was signed in Strasbourg by the five members of the commission and the United Kingdom in 1963. I attach the older flag (c1920?) with its six stars, but I'm unsure of the details? Could you or somebody enlighten me? UK ! The United Kingdom was a member from 1919 to 1993. It is now a member- observer. Italy was also a member from 1919 to the Second World war. I think the flag you show is correct. I don't have much about details, but Jos Poels wrote in the past an article about this flag in the magazine of the Dutch vexillological association. Cannot remember which issue. So does this mean the 6-star version was used between 1919-1993, but continued to be used until 2015 when this new 5-star version was approved? Are we missing a version here?